She breezed by my table on her way to sit with a 70-ish friend for coffee. She didn’t fit-in with the 20-somethings all around her. Acting like she had spotted an almost extinct bird species, she stopped at my table and motioned toward my open Bible. “You must be religious.” Then she touched the “National Pastors’ Convention” patch on my shirt. She muttered “pastor” as she turned toward the table where she was sitting. I wasn’t embarrassed; it was more like puzzlement or disgust. She could have called me “communist” and I would have liked that better than “religious.” Not that I’m a communist; ”religious” seems like such an insulting word. “Religious” is a stereotype and a meaningless word. You can call someone religious and still not describe what beats inside them. 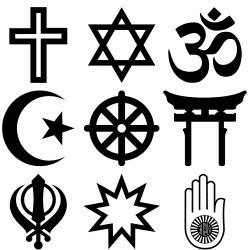 You can be a religious and subscribe to anyone of 4200 religions that exist in the world. Calling someone religious is like saying they’re a human being. It’s a blah-word. Non-descript. Innocuous. Safe. “Religious” is based on stereotypes. “If you go to church you must be religious.” But a coffee shop barista told me her most un-favorite day to work is Sunday when “religious” people come in. She called them demanding and rude. “If you carry a Bible you must be religious.” When the lady passed by my table she noticed my opened Bible and assumed I must be religious. On the other hand, I know people who study the Bible as a curiosity or a hobby, not to have their life changed by it. There are parts of the world where wars are fought in the name of religion. Some of the most intolerant and unloving organizations in the world call themselves “religious” but their ethics contradict their claims. “If you’re a clergy-person you must be religious.” Yet, our headlines are filled with stories of such folks who molest children and act with impunity on their desires. This is certainly not a model of “religious” that I would want to imitate. I would rather she had asked me a question rather than making an assumption. Something like, “what are you reading,” or “it looks like you are getting ready for something?” I could have told her I was preparing a sermon or that I am a disciple of Jesus. Either of those questions would have produced a smile rather than the look of utter perplexity. Good thoughts Bruce. I sometimes asks my fellow church members to not introduce me as their “minister” to their friends. I explain, “Give me a little time to show who I am before you give them my title. Otherwise I have to use their conception or misconception of what a minister is.